The following article discusses a few very simple intrusion detector circuits, or burglar alarms. The presented designs are easy to build yet extremely effective with the functions. A burglar alarm basically consists of a sensor and a trigger stages, which work together to produce the required detection. The sensor detects the presence of an intruder while the triggering stage responds to the sensor detection by instantly raising the alarm. 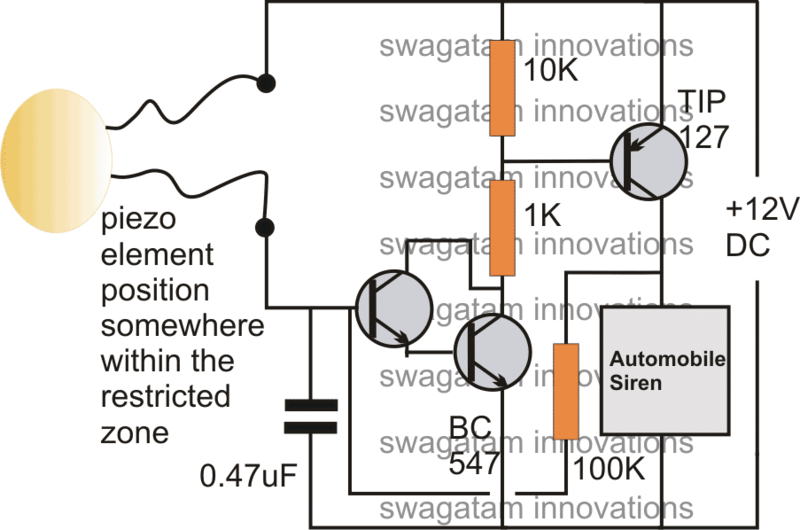 The triggering stage may consist of a voltage/current amplifier stage rigged with a relay driver stage along with a timer stage for keeping the triggering switched ON even after the threat is eliminated, for increased safety. The sensor pat is generally more sophisticated because it's the main section responsible for detecting the threat. Generally PIR sensors which work by detecting body warmth are incorporated in most hi-end types of burglar alarms, however here we'll try to implement reasonably similar results yet use ordinary arrangements for the sensor stage in the proposed circuits. This is probably the simplest one among all. As shown in the circuit diagram, the sensor is an ordinary thin wire conductor which is laid across the restricted area in such a way that anybody intruding the place gets caught up against the conductor and in the course breaks it up. Once the wire breaks, the transistor is allowed to receive the required base drive, ringing the attached alarm. This circuit is based on a sound detection through an inexpensive piezo element. The entire system may be fixed over the door or the restricted entrance. If an intruder tries to break in, the door would be disturbed instantly activating the connected piezo sensor, and the preceding alarm circuit. Burglar Alarm Using a Laser Beam. Today toy laser beam generator devices are pretty popular, and can be easily procured ready made from the market. This toy laser beam can be effectively implemented as an alarm sensor. 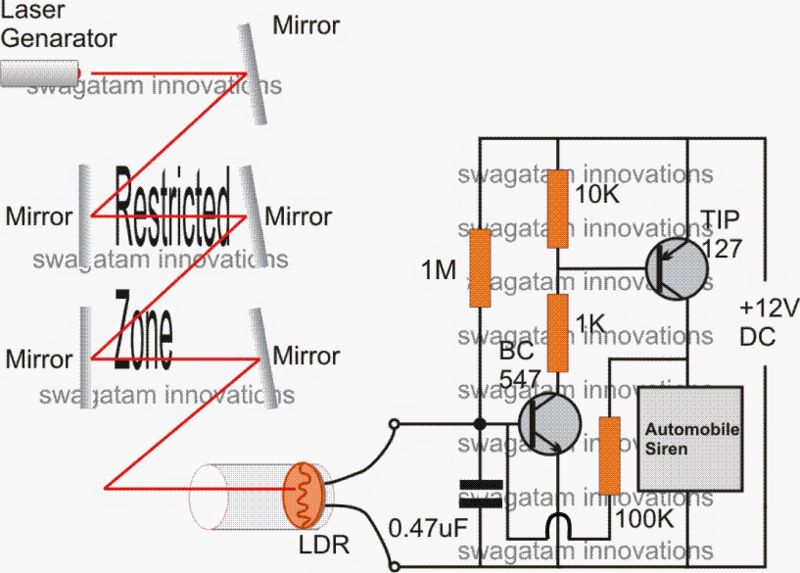 As shown in the figure, the restricted area may be swarmed by laser beams reflected across the area via accurately angled mirrors. 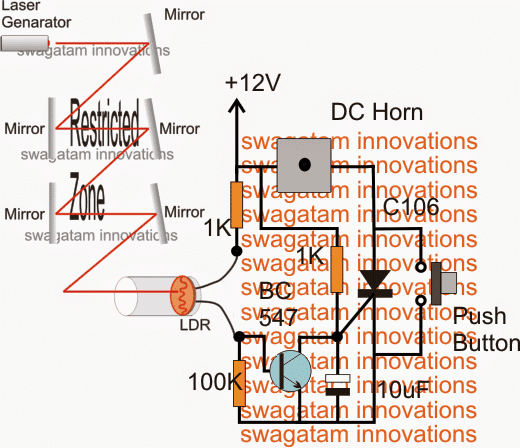 The final reflection gets directed toward an LDR trigger circuit. In case an intruder tries to trespass the premise, the person would block at least one of the reflections, interrupting the laser passage over the LDR. This would result in an instant triggering of the connected driver circuits. The above design of a latching laser activated alarm can be modified with a push button OFF feature. The following diagram shows how it's implemented using a single SCR, while the LDR, and the laser set up remains the same. The 12V input power should be switched ON only after the laser point is set on the LDR. I not to mention my guys ended up digesting the best helpful tips on your site and so immediately I had an awful feeling I had not expressed respect to the web site owner for those techniques. The people came very interested to see all of them and have now very much been making the most of those things. Appreciation for really being really helpful and then for getting this kind of extraordinary tips most people are really eager to learn about. My sincere regret for not expressing gratitude to sooner. Thank you so much moon, I am truly glad you liked my website. Please keep up the good work! 1st circuit. Ordinary conductor as sensor. Dear sir I want to latch the circuit. I put 100k resistor across bc547 Base and tip127 collector but nothing happens. What to do for latch sir? Hi Jayanth, it should definitely latch, please check your connections again. But the latching will happen only once the conductor is removed. No sir I made another circuit. Not latching. What to do sir? i made this circuit. it is working fine 10 meter distance IR beam with 12v buzzer. but i want to connect 12v siren. when i connect it is not making sound, i think it requires some more current than buzzer. sir how i increase the current? Hi Jayanth, TIP127 is capable of handling upto 3 amps comfortably, so current cannot be the problem, what is the specs of your buzzer?? i used 12 small buzzer it is working very well with the circuit. the 12v siren horn has no specs ha ha ha it is local sri lankan made that’s why.,,,..,,,its ok,. i parallel 2 buzzers now sound is quit enough. i made this laser beam for a dump yard entrance which has width about 10 meters. thanks sir. That’s great Jayanth, I am happy it worked for you finally…keep up the good work! How can I protect my sandalwood trees in our field from thieves or smugglers?if any circuits? please tell me the working of laser alarm. Good day John, the circuit is already too sensitive, actually you will need to reduce the sensitivity in order to allow the circuit to stay delatched at lower light level….to ensure this you can try increasing the 1M resistor to some higher value….but I don't think that's necessary because 1M is already quite high. Did you put the LDR inside a pipe? make sure you do this… and while testing you must keep the feedback resistor disconnected, and reconnect once the laser is set focused. 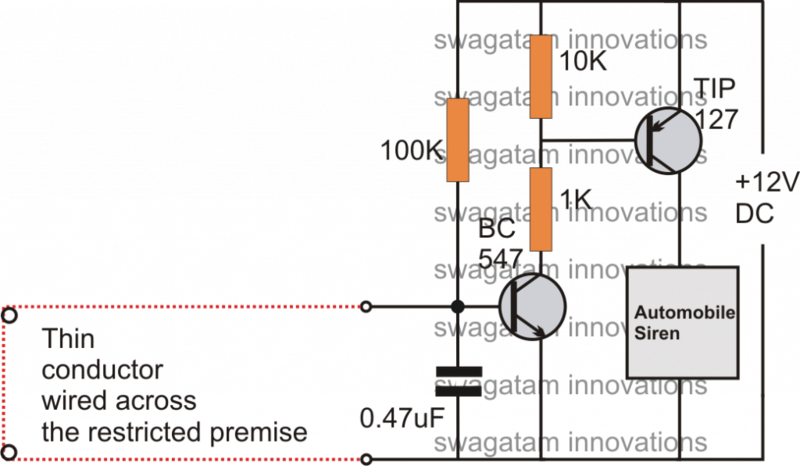 and the feedback resistor should be 100k or above this value….reducing it to 1K is not required. do i need to change resistors if i change the voltage of battery? Nur, that will require a GSM set up, not within my range. Rishi, please read and go through the comments for learning the exact procedure of setting up the circuit, if you just pluggin it'll keep buzzing forever. if the load is not above 50mA then it will do…. the emitter line of the transistor is the ground or the negative supply line. Pz recommend me which SCR I use instead of C106 . and a less costly SCR which is easily available. Thanks to reply to older comments. Hi Kuldeep, C106 is the most commonly variable SCR and is the cheapest one….so this scr is one you must use there's no other easier alternative. 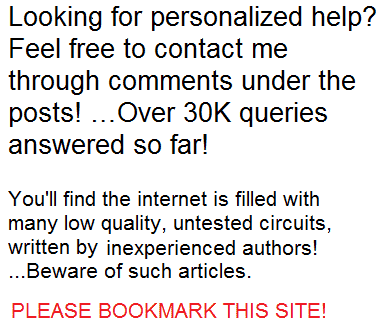 variable is a typo, i meant to say "available"
Your blog is best in the universe. Thanks to update the above article .I'm a beginner so I want to known that what is C106 and what is the voltage of 10uf capacitor and what is the common name of C106 because I live in a small city . My name is KULDEEP TRIPATHI and I'm a electronic hobbits and I'm a beginner on this . I saw your circuit it is so good but I have a problem I would like a situation in which the Buzzer stops manually after the switch on any disturbance in the laser light path , What shall I do or how I design circuit for the above situation . Is your circuit fulfill the above need ,If not then please provide me a suitable circuit . Sir please reply soon . Hi Kuldeep, I'll design the diagram soon and update it in the above article…. sir pz tell me if we cross the laser the alarm start ringing and ring without any stop I want to ring it without stop . answer soon. remove the 100k resistor which is linked from the collector of TIP127 to the base of BC547. Now, focus the laser or the any light source that you have selected on the LDR. This should instantly stop the buzzer. If the buzzer still does not stop, replace the 100k resistor connected from positive to base of BC547 to around 1M, and check again by focusing the light on the LDR, this time it will definitely stop the buzzer, and cutting of the light source will immediately activate the buzzer. Once the above procedures are confirmed, keeping the light focused on the LDR reconnect the feedback 100k resistor from the collector of TIP127 to the base of BC547. Now cutting of the light will instantly latch the circuit switching ON the buzzer permanently. If you don't want this permanent latching feature, you may just eliminate the feedback 100k resistor from the circuit. I used the laser versions of the ckt. I wanted to guard my bike so I used 4 sticks in 4 corners and glued a mirror on each stick. The main stick has a ckt board with both the LED laser and the LDR. The laser then reflects all around the 4 corners and comes back to the main board and falls on the LDR. The problem is that it takes a lot of time for me to adjust the sticks and mirror angles evertime I install it around my bike. Can you suggest a simpler solution? I want to know the importance of each component. 10k is for keeping the base of PNP transistor more towards positive so that it stays completely switched off while the circuit is not triggered by an intruder. The 1K is to protect and bias the PNP when the circuit is triggered and the NPN conducts. The 0.47uF makes sure that the NPN does not get triggered by stray external atmospheric electrical disturbances. How would one adapt this to a two-beam system where the alarm will only activate if the second alarm is triggered within a set time of the first? Attach the two in series and use a capacitor? Thank You !!!!! !…sir,It's working Perfectly would send you the pictures of the same shortly. You are most welcome Ajay! Sir,I have tested your laser burglar alarm and it is working perfectly.I have attached 1k in the feedback resistor as mentioned above in the comments.I wanted the alarm to buzz for some particular time by using 555 timer so would you suggest me how to do the same. Ajay, you can do it by using a standard 555 monostable circuit and connect its pin2 to the collector of BC547. Remove the TIP127, the feedback 100k resistor and use only the 10k from positive to the collector of BC547, the series 1k can be removed. ….The siren or the buzzer should be connected across pin3 of the IC 555 and positive. i need your help sir to make a switch that when the alarm is triggered, the alarm will not stop until i turn off the alarm switch. can it be possible sir? connect the trigger input with your circuit sensor, and wire the alarm with the relay contacts. You can try the last circuit, bring the shown parts and assemble it as per the diagram, if you have any problems you can consult me. TIP 127 is the perfect one and is quite common, I cannot see any other direct replacement for this transistor. tip127 is it an npn transistor or pnp? what equivalent i can use for tip127??? Yes all the above circuits need manual turning off, because all include latching ability, this can be removed in case an automatic switch off becomes necessary. do this circuit automatically turns off when light starts falling or turning it off manually??? i need " a circuit that need to be turned off manually "
I design a ne556 alarm circuit as receiver. But I have no idea how to design a transistor without battery to control my receiver (NE556 alarm circuit). Please give me suggestion as soon as possible . Thanks a lot. And I still have question do you have any ideas on design a circuit detect elderly fall down at home. Thanks. do you mind email me yanfang90@hotmail.com. Dear snow, i couldn't understand your question. "Elderly fall down" detector circuit can be designed.